The Perseid Meteor Shower peaks on August 11. What better place to be than in the Sierra Nevada Mountains with dark skies. Day 1: We will leave from the trailhead (about 7,220') at Rush Creek at 8 AM on August 9. We wuill ascend steeply for 1,300'. Along the way we will see a waterfall on Rush Creek. After passing Alger Lake, we will ascend another 500 feet to Gem Lake where we will camp..
Day 2: We will have only about 400' of gain on this short day. 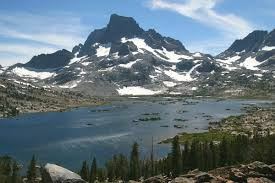 We will be camping at Waugh Lake with views of Banner Peak and Mount Ritter. Day 3: Our first rest day, with an optional day hike to Weber and Sullivan Lakes. Day 4: We will backpack to Thousand Island Lake, going over 10,200' Island Pass. Soon after the pass, we will pass small Ham and Eggs Lakes. Arriivng at Thousand Island Lake, we will camp on the Northwest Shore. Distance covered that day will be 6 ½ mils. Day 5: Our second rest day can include a partial cross country hike to Garnet Lake, and then to Ruby and Emerald Lakes. Day 6: We will re-trace our steps to Waugh Lake. Day 7: After returning to the trailhead, we will drive back to Southern California. You will need your ten essentials. Click here for the list. For a list of recommended gear, contact the trip leader. Bear containers are required. Carpooling is recommended to help reduce gas cost and parking. To go on this backpack, you must click on the "I'm interested" button and the trip leader will contact you.. This trip is limited to a total of five people.